In St. Petersburg, Florida — a city of about 257,000 residents sitting on the Gulf Coast next to Tampa — people have just a few options for getting around town. 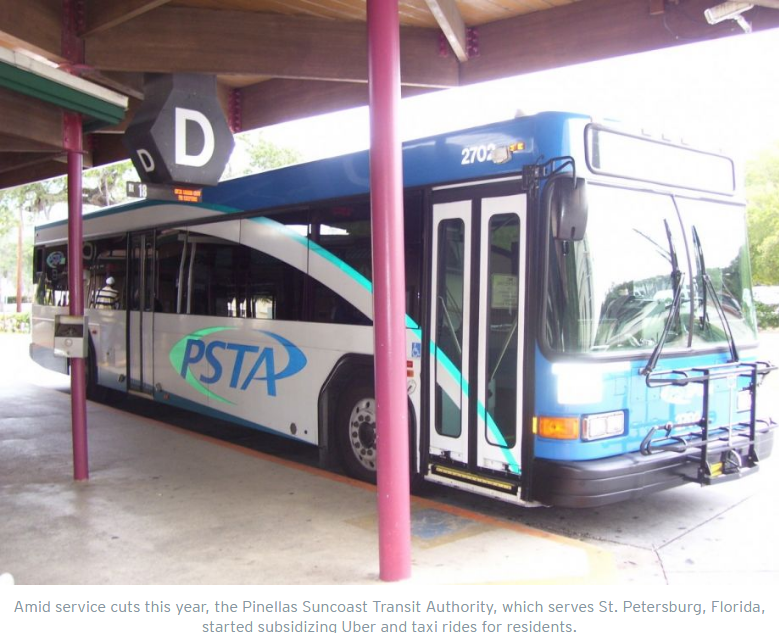 They can, of course, drive personal cars, walk or bike; catch a bus operated by the Pinellas Suncoast Transit Authority (PSTA); or hire taxis and Ubers. From February to August this year, the last mode choice on that list was likely the cheapest, most efficient option for accessing the bus. In an effort to encourage transit ridership and alleviate the impact of service cuts brought on by budget woes, PSTA was subsidizing 50 percent of the cost of taking rides with Uber, United Taxi (the local cab company) or Care Ride (a paratransit service) if those rides were connecting to the bus. That sort of partnership between public transit agency and ride-hailing company isn’t yet common, but examples are popping up around the country as cash-strapped municipalities look for ways to supplement their bus and rail routes and better serve low-density areas with so-so transit ridership. Those in favor of the arrangement say taking advantage of new technologies and service providers is a win-win for forward-looking transit agencies. Skeptics caution that the things that make companies such as Uber and Lyft profitable are incompatible with transit agencies’ obligation to provide quality, convenient, equitable service.